1972 CHANGES: A.I.R. HOLES ADDED TO INTAKE GASKET FACE/ EXHAUST HEAT CROSSOVER HOLES REVISED. AFTER JOB: PUSHROD HOLES ENLARGED TO .5625 FOR STEEL ROCKER ARMS. (SERVICE STEEL ARMS DO NOT REQUIRE LARGER PUSHROD HOLES.) BANK FACE OF BLOCK 1241735. REVISED TO HAVE TWO BOSSES AT CENTER INBOARD LOCATION TO SEAL NEW CORED HOLES IN 1973 HEAD (SEE FOOTNOTE 2). 1973 CHANGES tWO 3/4" ROUND CORED HOLES IN HEAD AND BLOCK REVISED TO 3/4" X 1-1/8" (SEE FOOTNOTE 2). TWO NEW 3/4" CORED HOLES ADDED TO HEAD. 1974 CHANGES HEAD GASKET 1247657 RELEASED WITH OVERHEAD OIL FEED HOLES ADDED TO SERVICE ENGINES PRIOR TO 1970 (SEE FOOTNOTE 3). 1974 CHANGES: CASTING NEW DUE TO CORED HEAT CROSSOVER HOLES AND ROUND COMBUSTION CHAMBER. COMPRESSION RATIO LOWERED TO 7.9:1 BY INCREASING COMBUSTION CHAMBER TO 4.73 CUBIC INCHES (WAS 4.33 CUBIC INCHES) EXHAUST VALVE SEAT WIDTH INCREASED FROM .060 TO .090. 1970-71 HEADS ARE NOT INTERCHANGEABLE WITH 1972-5 HEADS DUE TO REVISED INTAKE MANIFOLD FACE AT THE HEAT CROSSOVER AND A.I.R. HOLES. 1973-75 HEADS REQUIRE '72 AFTER JOB OR LATER BLOCK TO SEAL THE ADDED CORED WATER HOLES (SEE SERVICE BULLETIN 73-1-23). 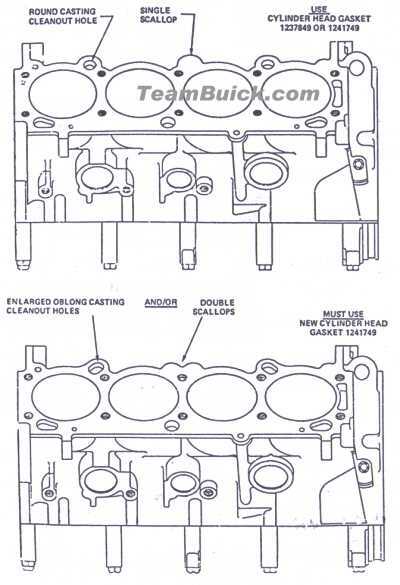 CAUTION: If the Basic Engines have the "double scallop" per illustration and the "oblong" holes, do not use the 1970-1972 Cylinder Head Gasket, 1237849. Use new Cylinder Head Gasket, 1241749. If the above Basic Engines have the "single scallop" per illustration and the "round" holes, the specified Cylinder Head Gasket, 1237849, for 1970-72 models may be used, or the 1973 Gasket, 1241749, may be used optionally as available.